Atlas surveys were conducted in predetermined areas to ensure the atlas covered the entire state. Most Atlases use a grid system to determine the survey area. 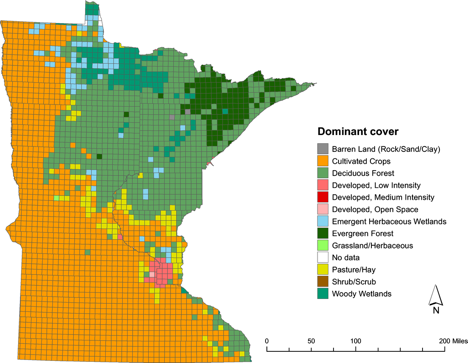 Minnesota chose the U. S. Public Land Survey System to select these areas. 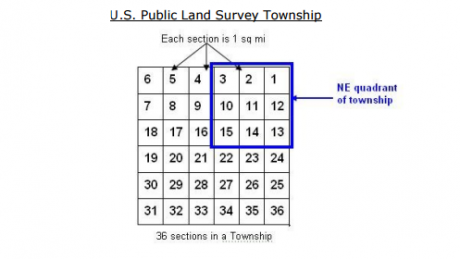 The Public Land Survey System is based on a 36 square mile area called a township. Townships are subdivided into 36 sections (each 1 mile by 1 mile). 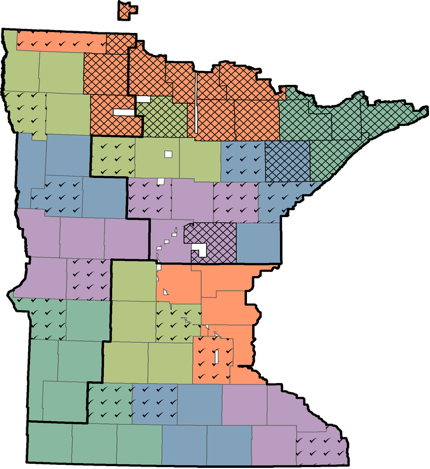 To reduce survey bias, the Minnesota Breeding Bird Atlas (MNBBA) randomly selected the NE quadrant (3 miles by 3 miles) of every township in the state to survey. These predetermined areas are called Priority Blocks. Rivers, state and county borders, or occasional variations in the grid system can create townships less than 36 square miles. In cases where the NE Priority Block was smaller than 8 square miles, we selected the SE quadrant or continued clockwise to select a complete quadrant. If the township had no quadrants that met the size criteria, the township was excluded from the MNBBA. Blocks were identified by the township and range number plus a one-letter code that described whether the block is the NE (a), SE (b), SW (c), or NW (d) quadrant in the township. For example, a block labeled T123R15a is in Township 123, Range 15,the NE quadrant of the township. Volunteers were recruited across the state to survey priority atlas blocks using standard atlas techniques. Details and guidance provided to the volunteers emphasized that as many priority blocks as possible, be covered, but many volunteers also covered secondary blocks, especially when it was convenient to do so. This was particularly true in population centers across the state. To insure coverage in more remote regions of the state, during several breeding seasons field personnel were hired to work in these regions and augment the volunteer data. A complete list of all the volunteers and personnel can be found under “About the Atlas”. The Minnesota Breeding Bird Atlas (MNBBA) used two complementary methods for gathering data on breeding birds of the state: 1) traditional, volunteer-based sampling, and 2) breeding bird point counts. The primary purpose of the volunteer network was to identify the breeding bird species present and their breeding status within the selected northeast quadrat (priority block) for each of 2,443 possible townships in the state of Minnesota. Volunteers could also gather data from any block within the state. With volunteer sampling, it is difficult to standardize the gathering of data on time of sampling, level of effort, and observer ability. Each of these requires a more rigorous, systematic approach to better assess habitat relationships, species relative abundance, and to detect bird population change over time. Each individual gathering point count data were also expected to record their observations outside of the point count periods both within the priority blocks and in transit between priority blocks. These observations were entered in the same fashion as the volunteers. Two examples highlight the importance of these complementary approaches. Volunteer efforts are of immense importance in gathering data for an atlas because it allows for extensive coverage of the state by participants with high skill levels. These efforts also allow individuals to gather data close to their homes and in their backyards. In contrast, volunteer efforts can result in uneven coverage of the state because they focused on urban centers or data gathering may be center on the “best” birding places. In addition, the skill levels of volunteers can vary considerably. The goal for including a network of point counts to gather breeding bird atlas was to insure equal and consistent coverage across the state of Minnesota. This included a random sampling approach and standardization of effort in gathering data within each township. Individuals participating in the gathering of point counts were also required to pass a test of 86 bird species songs or have more than 5 years of field experience in counting birds with point counts in Minnesota. Those gathering data on point counts were also tested by audiologists to insure their hearing ability was in normal ranges and they participated in three days of “standardization” in point count data gathering with an experienced field ornithologist. Specific objectives to be addressed by the point count protocol for the Minnesota Breeding Bird Atlas included the following. Estimate the relative abundance of breeding bird species in Minnesota. Identify where in the state breeding bird species were most likely to be detected in terms of habitat, landscape context, and climate regime. The basis for the systematic, point count protocol is a 10 minute observation/listening period with observations divided into 1 minute intervals. The basic technique has been developed and used by our group over a 20 years [e.g., National Forest Bird Monitoring Program (Hanowski and Niemi 1995a, 1995b; Howe et al. 1998; Hanowski et al. 2005; Niemi et al. 2016)]. The point count method of gathering data on breeding birds has been incorporated into many standard protocols across North America (e.g., Ralph and Rich 2005; Knutson et al. 2008). We have also completed an extensive analysis on detection for breeding bird species that have differences in their detectability in which excellent results using this technique were achieved (Etterson et al. 2009). The method is an effective technique for gathering standardized data in a time-efficient fashion. Most importantly, it allowed systematic data to be gathered from the entire state of Minnesota. During a 10-minute point count, all birds seen or heard are recorded (e.g., unlimited distance) but distances from the point are estimated to allow habitat-specific data to be used (e.g., observations within 25, 50, 100 m, and > 100 m of the census point). Point counts were completed from the last week of May (in southern MN) to the second week of July (northern MN), but most counts were be completed in June. Point counts were completed from approximately 0.5 hour before to four hours after sunrise on days with little wind (< 15 km/hr) and little or no precipitation. Extensions from sunrise to 6 hours were allowed for counts in western MN due to the high proportion of windy days and based on the experience of ornithologists in that region. All points were located and marked with a geo-positioning system (gps), cover type of vegetation visually estimated, and pictures taken in the two directions perpendicular to the road. In addition, incidental breeding evidence was recorded using the MNBBA breeding evidence codes. All data and pictures were entered into an online database. In cases where the point count was not gathered from a road, four pictures were taken in each of the four major cardinal directions (North, South, East, and West). Prior to the field season, tapes of MN bird songs were provided as a learning tool, and all observers were required to pass an identification test of bird songs for 86 species. In our previous efforts, a standard for number of correct responses was established by giving the test to observers who were trained in identifying birds by sound and who had four to five years of field experience. This was done to identify songs that were not good representations of songs heard in northern Minnesota or Wisconsin. Based on the results of trained observers, the standard for passing was set at 85% correct responses. Songs on the tape were grouped by habitat (e.g. upland deciduous, lowland coniferous) to simulate field cues that would aid in song identification. Observer field training was also conducted in late May. Observers completed simultaneous practice counts at several points used in the monitoring program. Data were compiled for each observer. These species lists and numbers of individuals recorded on these counts by each observer were compared to those of an experienced observer. Deviations in the number counted or species missed were noted and discussed in the field. In addition to field training and testing, all observers were required to have a hearing test to ensure that their hearing was within normal ranges, as established by audiologists, for all frequencies (125 to 8000 hertz). The overall goal was to sample within the priority block from each of the 2,443 townships in Minnesota over a five year period (2009-2013). A restricted, random process was used for selection of regional areas and within these regional areas townships were selected for sampling (Figure 1). Restricted random sampling was used because a purely random sample would be unrealistic due to logistical and practical considerations. For instance, it was unrealistic and too time consuming to force samples to be gathered too far from suitable access points, especially in areas with few roads. It also was not reasonable to gain permission and access to points on private lands. In most cases, we strived to have points sampled on smaller roads or trails as long as there was minimal interference from the road (Hanowski and Niemi 1995a). In the initial 2009 field season, three-two person field crews were used. Each team was selected to sample each of three broad regional areas of Minnesota: the northern forested regions, the western agricultural-grassland region, and the southeastern urban-transition forest region (Figure 1). These three regions provided initial information on any problems with this design that we may encounter throughout Minnesota during the initial 2009 season with the exception of the extensive roadless areas of the Boundary Waters Canoe Area Wilderness (BWCAW) and the Red Lake Peatland (RLP). Sampling in the BWCAW and RLP were delayed until 2010. Based on the 2009 sampling effort, it was determined that 3-5 townships could be sampled by one individual in a morning. For instance, in areas when there was an extensive road network within a township, five townships could be sampled in a morning. However, it was also necessary to visit each site the previous day or earlier so sampling in the morning could be accomplished in an efficient manner. In 2009 the crews sampled over 540 townships. Given this level of effort, it was estimated that we could sample all of the accessible townships within a five year period. Figure 1. Three broad regions were identified in the state to distribute the effort for gathering point counts over a five year period. These areas were the northeast, southeast, and western regions. Each region was divided into approximately equal 36-township clusters with each cluster including five regional strata (e.g., those with similar color). The five-36 township clusters were selected to represent the five years (2009-2013) in which sampling would occur in the Minnesota Breeding Bird Atlas. Those randomly selected for sampling in 2009 within each region are identified as those with check marks. Areas with too many inaccessible townships were identified with cross-hatching and were defined as those with 5 or more inaccessible townships out of the 36 possible townships within a cluster. These areas were sampled over four years from 2010 to 2013. As described above, within each priority block of a township the goal was to sample three points per township. Sample points were identified using a two stage process. Geographic information system (GIS) analysis was used to identify candidate points for all townships before entering the field. Once in the field, protocols were followed to determine if the point needed to be moved based of field level observations. The first point sampled within the township was a random point. A random coordinate was selected within the northeast quadrant of each township. Note that the northeast quadrant was randomly selected by the MNBBA field design team as the priority block for the MNBBA. The point counts were focused on gathering data within the priority blocks. The closest accessible point to a secondary road from the random point was selected for sampling. The second and third points to be sampled within the township were identified within the most abundant and second most abundant habitat in the township (Figures 2 and 3). 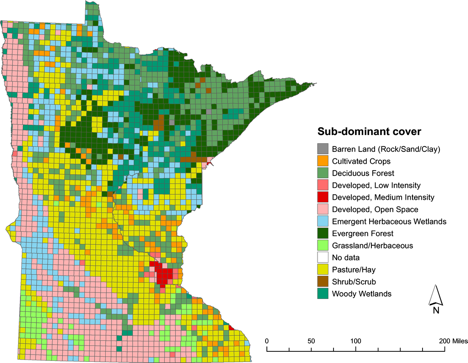 The National Land Cover Data (1999-2003) and Minnesota GAP data for the entire state of Minnesota with all primary habitat types identified at a scale of 30 m resolution (Homer et al. 2004). An expanded spiral search pattern from the random point was used to locate the nearest (straight line distance) points in each of the dominant and subdominant cover types that were within 50 m of an accessible road. Land cover was filtered so that a point was only considered within the target habitat if 40% of the land cover pixels in a 100 m radius were that cover type. Points were a minimum of 250 m apart to avoid overlap among the points. Note that the habitat types sampled were based on the entire township, but we sampled within the priority block. If the primary or secondary habitat did not occur within the priority block or was not accessible, the closest points within the primary and secondary habitats adjacent to the priority block, regardless of direction, were selected. In most cases this was not an issue except for agricultural areas where wetlands were often rare. In these cases it was sometimes necessary to travel reasonably long distances to sample other habitat types in the agricultural regions besides having all points within agricultural land types (e.g., cropland). After the automated GIS point generation was completed for the township, all points were visually inspected using aerial imagery to check inaccessible points for any potential problems in access (e.g., large industrial areas) and points obviously not in their target land cover class (e.g., outdated NLCD classification). Where necessary points were moved to suitable locations using the in-field point moving rules given below. Figure 2. Dominant habitat types within each township in Minnesota. Figure 3. Second-most dominant habitat type within each township in the state of Minnesota. Point is on private property (i.e. driveway, residential yard, or posted as private). Point is inaccessible via vehicle AND over 15 minutes away on foot. If suitable access, points can be accessed on foot. Point is in an inappropriate habitat type (i.e., point area has been modified). Point is within 250 meters of another point. Point is in an unsafe area (i.e., heavy traffic, construction, etc.). If a random point had to be moved, the following rules were used IN SEQUENCE to locate a new random point position, but the random point must remain within the priority block. Go to nearest accessible point that does not have excessive traffic or similar problem. If outside 250 meters from the next nearest point and in an acceptable position, place point here. If new position is not acceptable, travel in a randomly selected direction until first acceptable position is found, place point here. Note that each observer had a list of randomly selected directions that they used. If within 300 meters of another point, travel along road in a randomly selected direction until 250 meters away from nearest point, place point here if acceptable. If not acceptable, follow directions for number 3. If the dominant and subdominant habitat points were not located in the appropriate habitat type to which it was assigned, the point was moved to the appropriate habitat type. Sample target habitat types were defined as a minimum of 40 % or more of the survey area (100 m radius circle). Moving these points relied on the counters judgment, but the following rules were followed IN SEQUENCE and the points remained within the boundaries of the priority block. Using the aerial photo and/or visual observation, locate the closest proper habitat type adjacent to the public road. This often required substantial driving within the priority block. If acceptable, place the new habitat point IN the habitat. If private property, place the new habitat point on the road. Inaccessible priority blocks were sampled differently than those with roads. An inaccessible block was defined as a priority block with no public roads. This was a common situation in the Boundary Waters Canoe Area Wilderness (BWCAW), Red Lake Peatlands (RLP), and a few other areas in Minnesota. In these situations, access via water (canoe or boat), trails (ATV or bike), or in the case of the RLP we used MN DNRs “Marsh Master” were used to gain access to the block. The most convenient access point within a priority block was identified. The random point was selected from the closest foot-accessible location where observers started their morning survey (e.g., along a trail or portage). Dominant and sub-dominant habitat types were defined based on the NLCD data base and were selected a priori from the access point with the same distance restrictions as described above. These locations were usually re-located based on ground reconnaissance. In some cases the habitat types identified a priori were unsuitable, so the same criteria were applied to identify another suitable habitat type for the point; however, instead of using public roads, considerable latitude was given for the use of portages or other access venues (e.g., canoe, boat, bike, etc.). In most cases, inaccessible blocks were covered with two individuals and only one priority block was attempted to be covered in one day. In many cases these one day visits were the only time many of these priority blocks were covered, especially if they were in remote situations such as in the BWCAW and RLP. Acknowledgments: We thank Matthew Etterson, Diane Granfors, Janet Green, Robert Howe, Melinda Knutson, and Bonnie Sample for comments on this protocol. The follow background materials were available to all atlas volunteers to aid and guide their field efforts. Each was provided in a pdf file that required Adobe Acrobat Reader. Includes background on the project and all instructions, guidelines, and forms needed to conduct a survey. Etterson, Matthew A., Gerald J. Niemi, and Nicholas P. Danz. 2009. “Estimating the Effects of Detection Heterogeneity and Overdispersion on Trends Estimated from Avian Point Counts.” Ecological Applications 19: 2049–2066. Hanowski, Joann M., and Gerald J. Niemi. 1995b. “Experimental Design Considerations for Establishing an Off-Road, Habitat Specific Bird Monitoring Program Using Point Counts.” In Monitoring Bird Populations by Point Counts, edited by C. John Ralph, John R. Sauer, and Sam Droege, 145–150. General Technical Report PSW-GTR-149. Albany, CA: USDA Forest Service, Pacific Southwest Research Station. Hanowski, Joann M., Jim Lind, Nick Danz, Gerald J. Niemi, and Tim Jones. 2005. “Regional Breeding Bird Monitoring in Western Great Lakes National Forests.” In Bird Conservation Implementation and Integration in the Americas: Proceedings of the Third International Partners in Flight Conference, edited by C. John Ralph and Terrell D. Rich, 974–981. 2002 March 20-24; Asilomar, California; Volume 2. General Technical Report PSW-GTR-191. Albany, CA: USDA Forest Service, Pacific Southwest Research Station. Knutson, Melinda G., Nick P. Danz, Todd W. Sutherland, and Brian R. Gray. 2008. Landbird Monitoring Protocol for the U.S. Fish & Wildlife Service, Midwest and Northeast Regions. Version 1.0. U.S. Fish and Wildlife Service Biological Monitoring Team Technical Report BMT-2008-01. LaCrosse, WI: U.S. Fish and Wildlife Service.